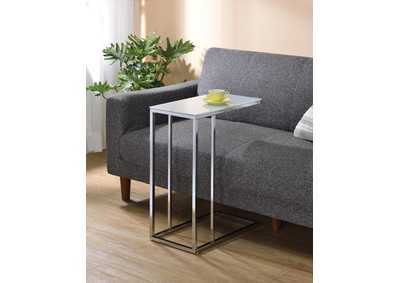 Place this lightweight, yet well-balanced, table up to your sofa for a convenient place to set a drink or snack. The base features four closely-positioned legs for strength, while the table's top extends past the legs to hover over the edge of your furniture. In a chrome finish with a frosted, tempered glass top, this table will add a contemporary look along with functionality.